Lumbago or lower back pain, affects 80% of people at some time or other and is one of the main reasons people come to see us at Touch2Heal, but the causes of lumbago can be quite varied. Common causes include poor driving positions, heavy lifting and muscles strains due to activities such as gardening or cleaning. We also find more and more people with postural problems caused by sitting at a desk. Poor setup can increase pressure on the lumbar region. If you injure your back there are a number of different musculoskeletal issues that can cause pain. Muscular strains are usually the prime problem but joint inflammation or ligament damage are common too. 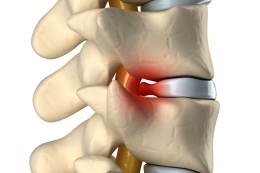 A slipped disc (herniated or prolapsed disc) is another regular source of pain. Lumbago will often manifest itself as dull aching sensation, particularly in the back, buttocks and thigh. It is not unusual for this pain to be sharp or even excruciating at times during particular movements. You will often discover with a disc injury that simply sitting can promote pain. Alternatively, a sudden movement might do it. A trapped nerve can be debilitating (Sciatica), often the result of a prolapsed disc. There are several causes of Sciatica but the most common cause we see is a herniated or prolapsed disc, i.e. a slipped disc. Unfortunately the disc is not strong against rotational forces and these can cause the disc to rupture. Such forces can occur simply by bending awkwardly or lifting something heavy. Osteopathy and acupuncture can offer relief for lumbago. At Touch2Heal our practitioners apply joint mobilisation, deep soft tissue work and acupuncture to overcome your back condition. To help rehabilitation we provide postural guidance and advice on relevant exercises. If you suffer from lumbago then come to see us in our clinic in Ashford, Kent.